Nichole may hate jellies, but I don't! I don't wear them on their own, but I love them as a finishing touch for glitter. They unify the look wonderfully. Back in October I posted a few jelly toppers (think jelly sandwiches with a non-jelly base) and today I've got a few more. This started off with Nicole By OPI No Limits, topped with Too Rich For You, then Sweet Dreams, jellied up with China Glaze Creative Fantasy. If you follow me on Twitter, you've seen this for a little while now as my display photo. I was so in love with it when I wore it! I still am, looking at it here. I bought Creative Fantasy because I *needed* a purple jelly. More on its awesomeness in an upcoming post. I figured if I'd loved that combo so much, I might as well treat my other Selena Gomez glitter similarly. 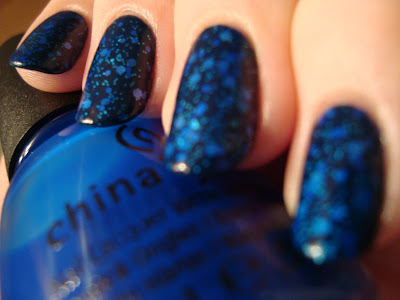 This is Nicole by OPI Khloe Had A Little Lam-Lam and Inner Sparkle topped with China Glaze Ride The Waves. I didn't love this, I just liked it. Both Ride The Waves and Creative Fantasy are...odd, but in a cool way. I'm tempted to describe them as dark neons (weird, right?) more than true jellies. They both dry a bit matte and I liked it, so I didn't top coat them. They're also not as sheer and deep as jellies. Still, I love them both! China Glaze is releasing six neon jellies this summer and I'm already eyeing the blue, purple, and green ones. This last one is a straggler from the older jelly topper post. It's from last October, just a few days after that post....it's just taken me a while to have a cluster of them to show you! I used Finger Paints Black Expressionism, Spoiled Ants In My Pants, and Essie Skirting The Issue. I flat-out adored this. It's easily one of my favorites from last year. When I was out shopping while wearing this, several people asked me what polish it was. One woman told me I was "sneaky" when I told her it was three polishes layered! That's probably the funniest thing a stranger has ever said to me about my polish. I *wish* it went on like this. I'd wear it all of the damn time! Photos can't begin to express how deep and stunning it was. It's a shame Nichole lives so far away...I'd plunk her down at my vanity and test swatch until I found a jelly combo she'd love. I know I could! haha, maybe for my birthday you could send me some? Am I Running A Fever? DIY Hand Sanitizer...for nail art?